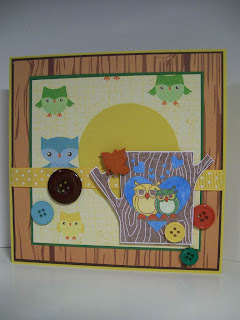 Here's my card - what a hoot! The owl image is a Taylored Expressions stamp and it was given to me by a very special forest friend. Thank you, Joan! 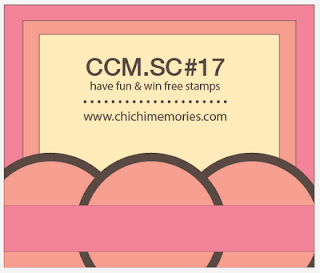 Chi Chi Memories Challenges go for two weeks, which allows more time for creating and participating. That's a good thing! 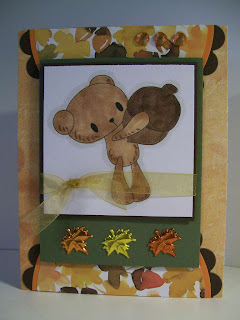 Soooooooo I've made another card for this week. It's based on the challenge sketch. The sketch is fun to use... why not give it try! Happy Birthday to you.......... happy birthday to you........ happy birthday, dear friend! Happy Birthday to You! Sorry! Didn't mean to sing off-key. Today is a very special day! It's time for a new Digi's With Attitude! Challenge, but it's also the day to announce the winner from last week's Digi's With Attitude! Blog Hop. Audrey, be in touch and we'll get you your free image. The design team was given the Digi's With Attitude! Grumpy Gretchen Big Deal Birthday image to use in creating our cards for this week's challenge. 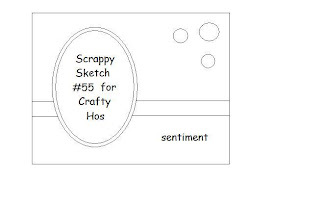 Participants can flip or adjust the sketch (slightly anyway) to fit their needs. The Digi's With Attitude! Grumpy Gretchen images are so fun to color and spunky to create with, too. I actually printed two of the images so I could give it some depth. I colored and cut out the arms/cake on the extra image and popped it up off of the main image. I hope you'll join us in this week's Digi's With Attitude! Challenge... it's going to be lots of fun! This is such a nice image! I hope you'll play along in this week's challenge! Pretty fun, isn't it? Now it's your turn!!! Oh, and as I told you a few days ago, Fresh Brewed Designs is having a DT call! Here's your chance............ APPLY! Today's Treasure is actually half of a treasure... tee hee! I used a piece of the gasket cork (yes, the kind for cars!) 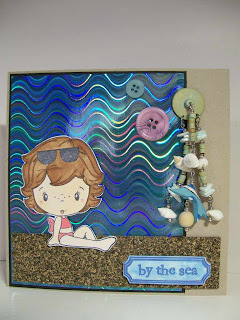 which gives my beach some really fun texture. I used the aquarium filter to speckle some ink onto the image, giving it a textured look. I just love this fun image! SWEET! 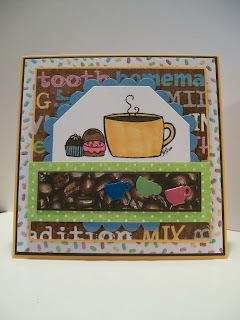 That reminds me... you still have time to play along with this week's Fresh Brewed Designs Challenge. 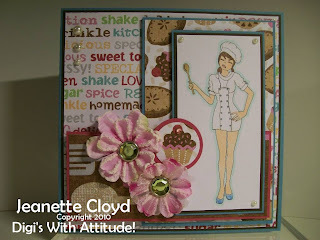 It's a YUMMY SWEET TREATS Challenge! 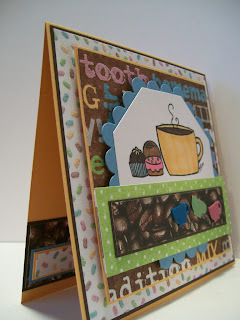 Fresh Brewed Designs images are creative and fun to use. And Heather, the owner, is such a joy to work with. THANK YOU, Heather, for allowing me to be part of your Design Team!!! 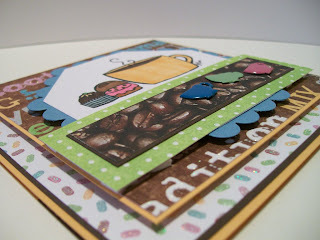 Fresh Brewed Designs is going to have a DT Call very soon! Digi's With Attitude! 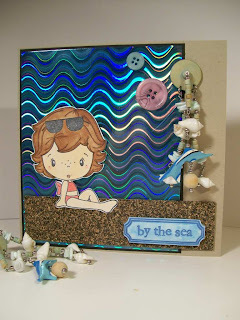 is having its very first Blog Hop and I am honored to be part of the fun! Let me encourage you to participate in the entire blog as there are some awesome prizes to be won! If you didn't start the hop at the beginning, please go to the Digi's With Attitude! Challenge Blog, so you won't miss any of the stops along the way. 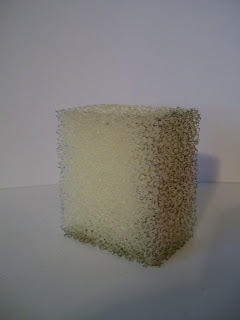 Before I show you my project for the blog hop, let me share some important information with you regarding the hop. Rules: In order to be eligible to win hoppers must comment on ALL blogs in the hop. The hop will begin and end on the Digi's With Attitude! Challenge Blog where you will post a comment stating which Digi's With Attitude! 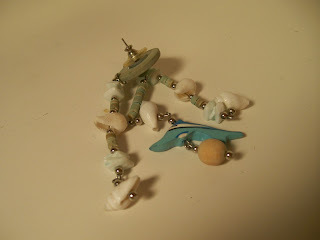 image is your favorite once you have visited all blogs and the shop. If you choose to play in the Digi's With Attitude! Challenge you will be eligible to win the Grand Prize! If you choose to comment on all blogs AND play in the Digi's With Attitude! 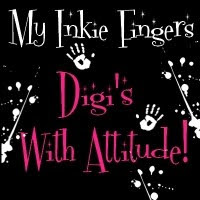 Challenge you will be eligible for the BIG INKIE ATTITUDE PRIZE!! The hop will close on Wednesday, October 27th at 11:59 EST. Prizes: Digi's With Attitude! Digital Image, Digi's With Attitude! GiftCertificate, MyGrafico Digital Papers & a CSN Store $65.00 GiftCertificate!!! 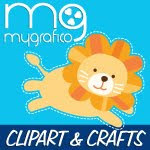 Free Digital Image & $10 Gift Certificate! 1. 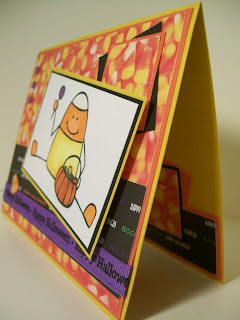 DIGITAL IMAGE: I will pick a random winner from all who commented on my blog and post it on October 29th. The winner will receive "Grumpy Gretchen The Queen" Winners will have 48 hours to claim their prize. So check back or subscribe to my RSS feed to get instant notification if you won! If you do not claim your prize another winner will be randomly selected. [Queen Gretchen] If you have already purchased this image from the store and have your receipt we will substitute for any other image. 2. 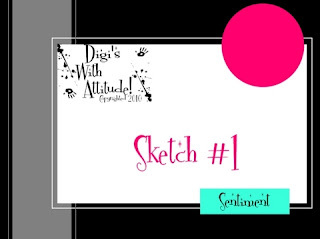 GRAND PRIZE: One random winner will be also selected from the Digi's With Attitude! Challenge Blog. 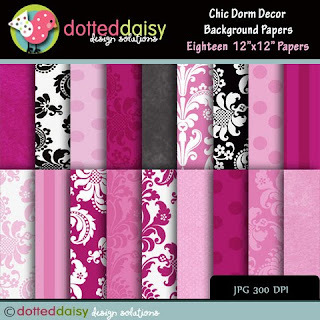 This person will receive 2 sets of Digital Papers compliments of MyGrafico and a $10 Digi's With Attitude! Gift Certificate . You must be a Digi's With Attitude! Challenges follower to win the Grand Prize. 3. THE BIG INKIE ATTITUDE PRIZE: One random winner will be selected for a $65.00 gift certificate for CSN Stores. So you can stock up on paper crafting supplies or shop for a "Drop Leaf Table" to add to any space in your home or studio. The gift certificate is good at all CSN Stores (not including taxes and shipping) You must have commented on all blogs, played in the Digi's With Attitude! Challenge and be a follower to win this prize. Winners have 48 hours to claim their prizes so be sure to check back on October 29th to see if you are a lucky winner. Digi's With Attitude! Challenge Blog - This is where you want to start the hop! 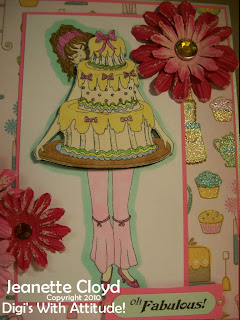 Jeanette - you are here! "Bling It On Challenge #3"
Just like it says,Bling It On!! 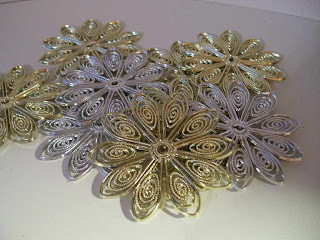 Add bling to any project and enter to win! Grumpy Gretchen Chef wants to cook up something special! 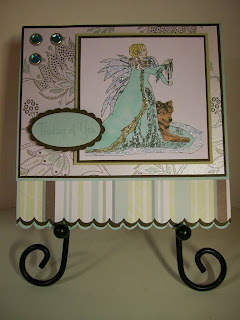 I hope you have fun on the blog hop and participate in the Bling Challenge, too! 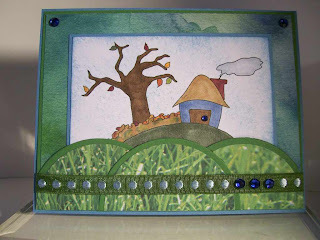 Be sure to leave a comment and then head on over to Viv's blog to see what she has in store for you. 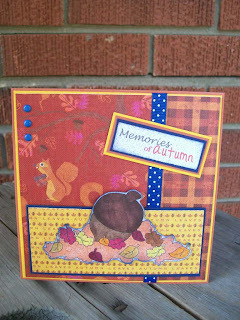 NOTE: I have two blog posts today - this Chi Chi Memories one and the Stamp-N-Doodle one that follows it. Thank you for looking at both of them! Chi Chi Memories Sketch Challenge! 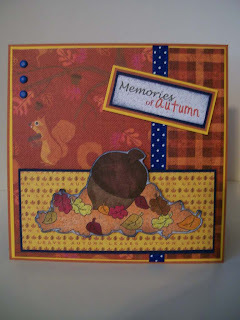 I created my card with one of the adorable images from the Autumn Memories set. 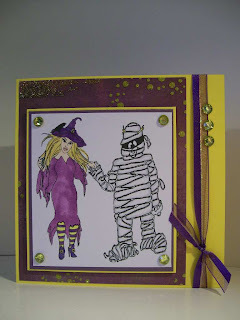 Participants are to use embossing, a bat, and glitter on their creations. 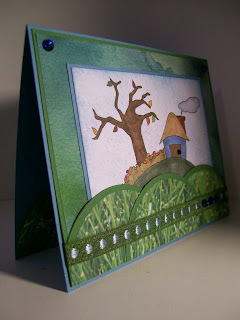 For my main background paper, I used a Cuttlebug embossing folder to give the card texture, as well as fulfilling one of the challenge criteria. The purple dots are actually pop dots placed between the circles on the embossed paper and then covered with purple glitter. I also put glitter on the star. 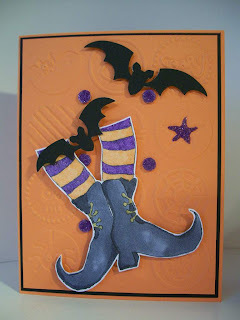 The two bats were made with a Sizzix die. Nothing is sweeter than baked goods and a refreshing cup of coffee, right? 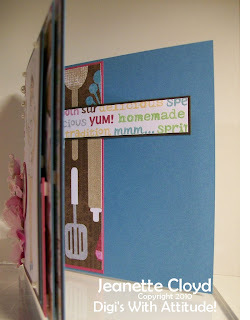 I used layers and layers of paper, even some inside my card. Mug brads are a fitting embellishment. What is your idea of Sweet Treats? 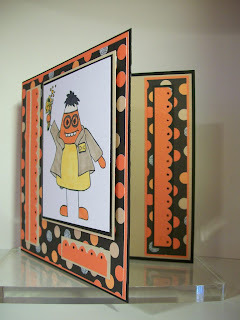 It's Tuesday... time for a TREASURE HUNT creation! 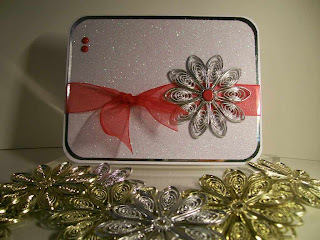 I used glitzy papers from Target to make the card sparkle and shine! 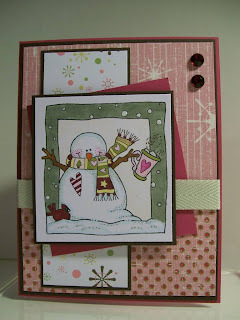 I also like making snowmen cards. 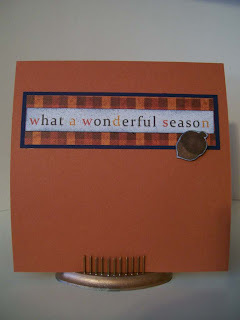 The sentiment inside the card reads Happy Freezin' Season To You! C.C. 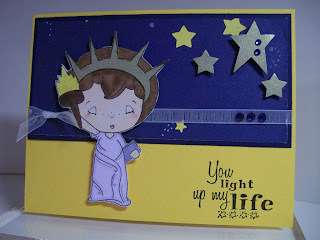 Designs Fairy Tales "Liberty"
I used the image instead of an oval and stars instead of circles. hmmmmmm... maybe I need to go back to kindergarten and learn my shapes. Tee Hee! Image and Sentiment: C.C. 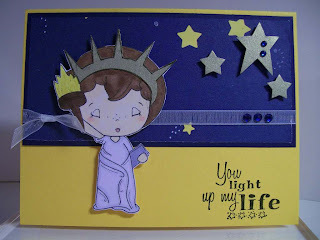 Designs Fairy Tales "Liberty"
You might remember that last week I told you about a 2-week Chi Chi Memories Sketch Challenge. If not, you can check out that post by clicking here. 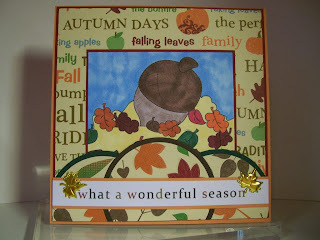 This card is a bit unusual in the fact that the card base is a piece of very heavy/stiff designer paper instead of Stampin' UP! 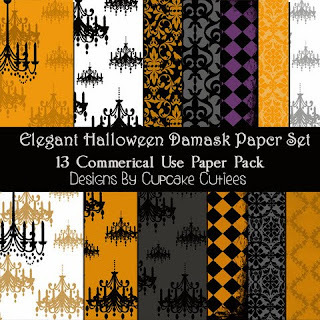 cardstock. I like the textured look it creates. 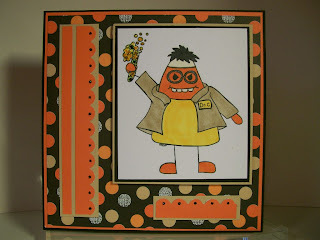 Note: I have two blog posts today - this one featuring the Digi's With Attitude! Challenge and the Dueling Darlings one that follows it. Please check them both out. Last week was the first Digi's With Attitude! Challenge and here we are already with Challenge #2. I hope you'll play along!!! 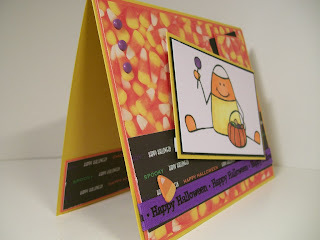 It's a Color Challenge: You must use orange, purple and green on your card. 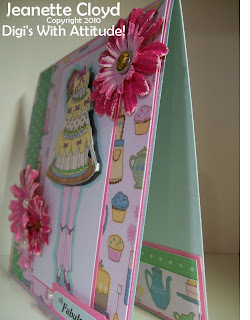 My card uses traditional papers, but soon I'm going to try making/using digital papers. Perhaps you've been wanting to try them, too. 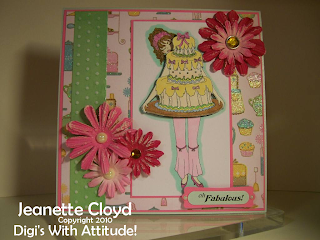 If so, be sure to check out the tutorial on using digital papers on the Digi's With Attitude! Challenge blog. Image and Sentiment: Digi's With Attitude! 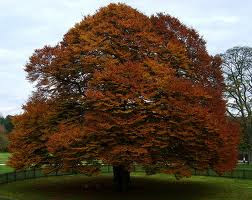 It's October 15... do you know what that means? 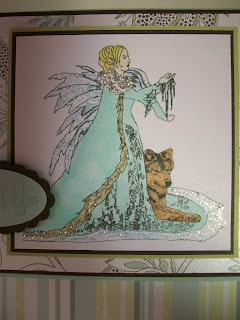 It means it's time for the Dueling Darlings to post this month's creations! For those of you who may not know who/what Dueling Darlings are... we are 14 online friends who challenge each other's creativeness. 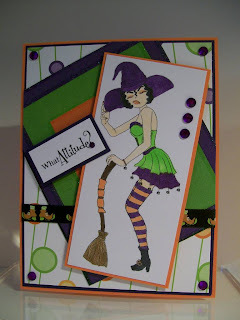 Each month - on the 15th - the Dueling Darling Divas and the Dueling Darling Dazzlers create cards using identical products sent to them by the hostesses. While both hostesses have the same theme, the products are a suprise. For me personally, one of the most exciting aspects of the duel is seeing what images/etc the other team is using. Debbie sent all of the Dazzlers (of which I am one) the most incredible kit. 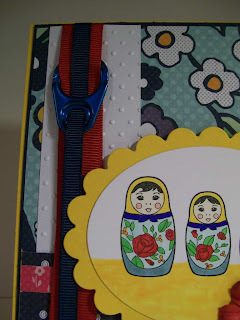 I immediately fell in love with the image - an adorable nesting doll set from Stampin' UP! 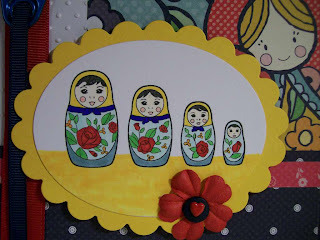 called My Matryoshka. Having traveled to the country of Kazakhstan twice, I actually have several Matryoska dolls in my home. They hold a special place in my heart. 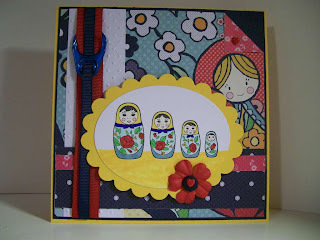 The designer paper Debbie included - Kaiser Craft Mumma Bushka, Misha and Mumma Bushka, and Inka continue the delightful theme of Debbie's kit. 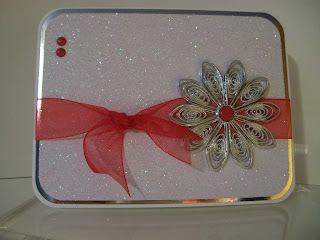 Debbie sent the Dazzlers everything you see on my card except the cardstock and one special item. Each Dueling Darling was asked to include a "treasure" f some sort on her card. The "treasure" stipulation was that it could not be brand new. It had to be some type of recylced item. 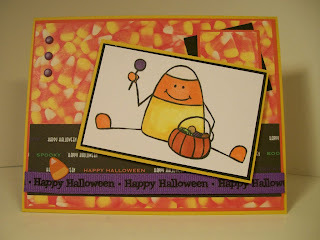 Yes, that's right... the Stamp-N-Doodle challenge this week is to make a Halloween card WITHOUT USING black or orange. More challenging than one might think. LOL! What colors will you choose to use? It's a Day of Firsts!